VERE Optical Breadboards are 3/16" thick Aluminum skins laminated to a nonmetallic honeycomb core. The core has 3/8" honeycomb cells with inherent broadband energy absorption, eliminating the need for additional internal dampers to suppress the resonance found in metal cores. Holes are sealed with a polymeric film that punctures when used, allowing the full depth of the breadboard to be used. Flatness: 0.007" over 1' cumulative distance. Self damping side panels. 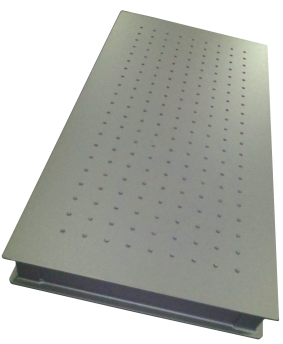 Featuring 1/4-20 holes on a grid spaced 1"center to center.